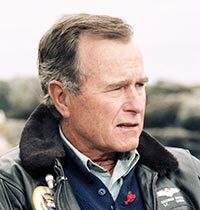 In accordance with President Bush's wishes, the George Bush Memorial Endowed Fellowship Fund has been established to support The Bush School of Government and Public Service at Texas A&M University, the site of his Presidential Library Center. This special Memorial Fund will support The Bush School in perpetuating President Bush’s legacy of service, and educating the next generation of public servants to lead with integrity. As such, all gifts will be processed and receipted through the Texas A&M Foundation. We will acknowledge your gift as well as send a receipt to the address provided on the giving form. Please write President George H.W. Bush Memorial Fund Account #57819 on the check. as indicated by an asterisk (*). The minimum amount for this account is $1.00. For refund or gift processing requests, contact Jenna Jakubik, pledge & online gift administrator.